Green: Used for deep wet scrubbing or light stripping of floor wax. Aggressively removes dirt and scuff marks from heavily soiled floors. Recommended for use on machines up to 350 rpm. Blue: For light scrubbing or heavy duty spray cleaning. Aggressively removes dirt and scuff marks from heavily soiled floor prior to re-coating. Recommended for use on machines up to 350 rpm. Auto Scrub/UHS Cleaning: Cleans light dirt and scuff marks. Open construction and resilient characteristics produce the highest results with auto scrubbers. Recommended for use on machines up to 1500 rpm. Flamingo: Ultimate performance when used with auto scrubbers. 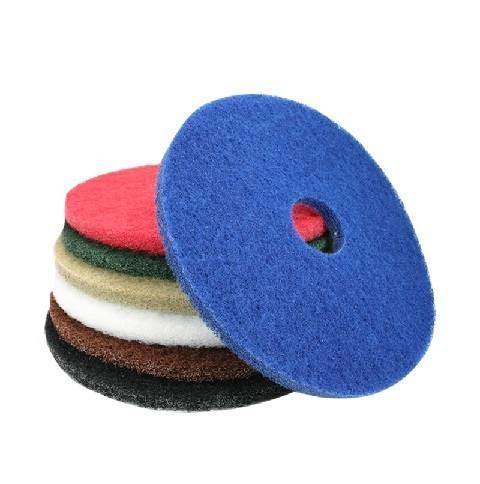 Cleans light dirt and scuff marks including black heel marks, preparing floors for burnishing. Recommended for use on machines up to 350 rpm.